Kwe Unglis Haida Dancers John and Rachel Hewer and Treena Decker perform during the Take Back the Highway event at the Nisga’a Hall on Oct. 4. Hundreds of people attended a community feast and vigil in Prince Rupert last week, held to commemorate missing and murdered Aboriginal women and girls along Highway 16 and across Canada. The North Coast Transition Society (NCTS) has hosted Take Back the Highway events annually for nearly a decade to raise awareness on deaths and disappearances of women and girls along the 724 kilometre stretch of Highway 16 between Prince Rupert and Prince George. Nearly all the victims were Aboriginal. This year’s massive event was organized in collaboration with the Friendship House Association of Prince Rupert and Gitmaxmak’ay Nisga’a Society. More than 300 community members packed into the Nisga’a Hall for the community feast and vigil, with Prince Rupert’s gathering being one of nearly 100 similar events held across Canada on Oct. 4 as part of the Native Women’s Association of Canada’s Sisters in Spirit vigil movement. Grainne Barthe, NCTS program manager, said the event offers a place of healing for the community. “Even though it’s a tremendously sad issue, I think everyone left feeling good. It was a very uplifting evening,” she said. Before a moment of silence was shared, the names of 18 women lost along the Highway of Tears were read aloud, along with something about their lives. Vicki Hill, whose mother Mary Jane Jill was found along the highway outside of Prince Rupert in March 1978, spoke about her pursuit of finding justice at the event and urged the crowd to not blame victims. “They all had a heartbeat, like each and every one of us,” said Hill, who was six months old when her mother was killed. “I’ve pretty much accepted what happened to her. But I’m not going to give up hope,” Hill said. 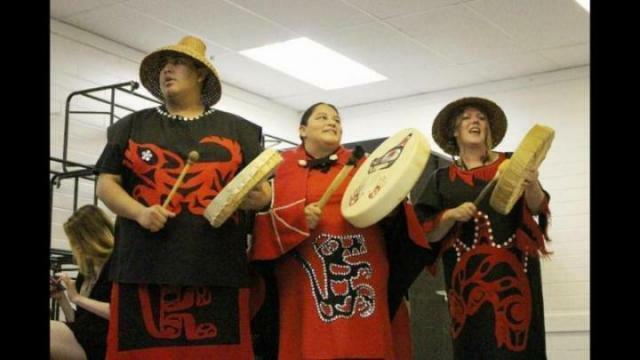 The event also included powerful performances by First Nation dance groups Kwe Unglis Haida Dancers, the North Coast Ceremonial group and Gisigwilgwelk (Big Northern Lights) Dancers. Furthermore, NCTS took the opportunity to reveal its newest Take Back the Highway T-shirt at the event. The society held a contest in September for a new logo, receiving 18 submissions from around B.C. “It was such a difficult decision because every single design was so heartfelt. You can tell the amount of thought that went into each of them,” Barthe said. NCTS selected William Cooper from Kitkatla as the winner. Each aspect of Cooper’s Aboriginal design represented the lives of those taken along the Highway of Tears and the emotions provoked by the losses. To purchase the new Take Back the Highway T-shirt, call (250) 627-8959.